Sleep is one of our most basic human needs and it is essential for overall health. Sleep disorders are modifications in sleeping patterns or habits. Studies show that lack of sleep leads to decreased function during the day, including a lack of concentration, irritability, and a weakened immune system. 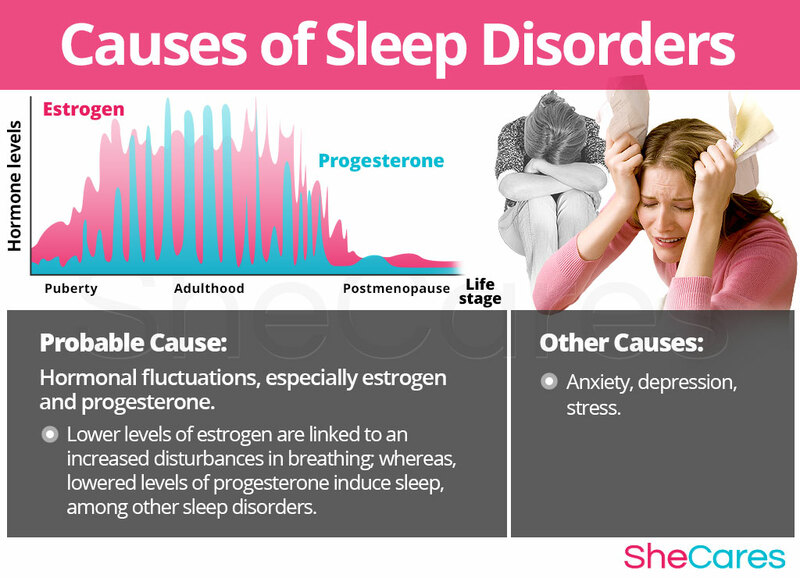 Hormonal changes can profoundly disrupt a woman's sleep cycle. As a result, sleep deprivation can also affect hormone levels resulting in a terrible restless cycle. When hormone levels dramatically increase or decrease during puberty, pregnancy, post-partum, or menopause, women may be particularly vulnerable to sleep problems. Fortunately, sleep disorders can be managed and treated. Continue reading to learn about sleep disorder causes, risk factors, symptoms, prevention, and treatment options. More than 40 million Americans suffer from sleep disorders. However, women are affected by sleep problems in greater numbers than men. Women who experience numerous sleep disturbances during pregnancy are more susceptible to postpartum depression. Approximately 16% of postmenopausal women report having trouble falling asleep, and 41% report waking up frequently during the night. The rate of insomnia rises among women at a rate of 40% during the transitional period from menopause to postmenopause. Sleep disorders, in general, refer to any ailment that affects the normal sleep patterns of a person. Women experiencing sleep disorders persistently undergo disruptions in their sleep cycles, perhaps waking up frequently during the night, or waking up too early in the morning. Depending on the severity of the disturbance, sleep problems can adversely affect emotional and physical functioning, resulting in insomnia, snoring, and sleep apnea. On average, a healthy adult needs approximately 7-8 hours of undisturbed sleep per night. However, many women do not receive the proper amount. Those with sleep disorders experience the persistent problem of going without the recommended amount of uninterrupted sleep, leading to a weakened immune system, increased anxiety, and a worsening of any pre-existing medical conditions. Sleep disorders may also place a strain on business or personal relationships, and cause emotional disturbances. Women wake up more often during the night and, as a result, are tired and can't concentrate during the day. The sleep cycle is highly important to maintain a healthy demeanor and immune system; and sleep disorders throw this into disarray. 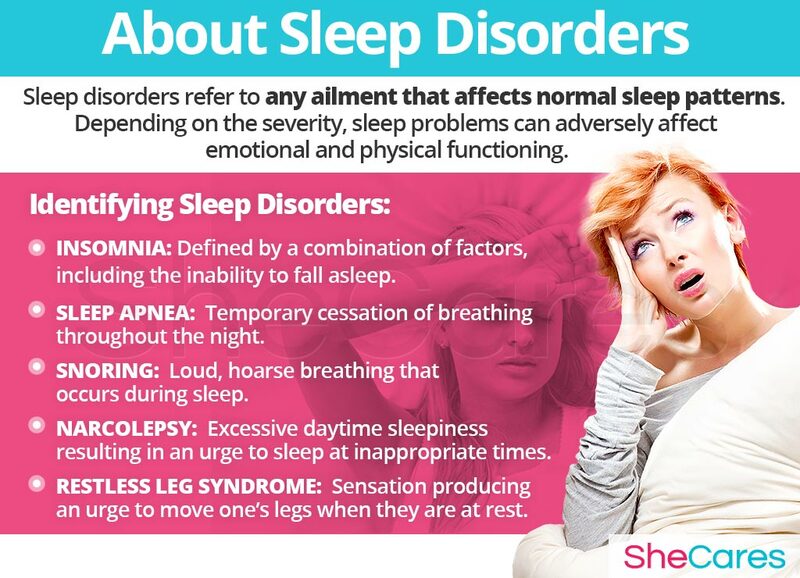 There is a wide variety of sleep disorders. Gallup polls estimate that there are 65 million sufferers of the 70-80 types of sleep disorders that exist. As people age, there is a tendency to get less sleep in general, as well as less time spent in the deepest, most beneficial periods of the sleep cycle. The most commonly reported sleep disorders in women are insomnia, sleep apnea, snoring, narcolepsy, and restless leg syndrome (RLS). Due to the wide variety of sleep disorders that are known, it is likely that the difficulty with which one is living can be identified and treated by a sleep specialist. However, the first step is to understand the causes of sleep disorders and then take the proper steps to address them. Continue reading to learn all about these causes. Many women report sleep disorders during menopause, which can be caused by a variety of problems, such as uncomfortable menopausal symptoms like night sweats. Women must balance hormonal changes, physical and emotional upheaval, family, work, and relationships; so, the importance of a good night's rest is crucial. Sleep disorders are consequently one of the most insidious symptoms of puberty, pregnancy, the post-partum period, and menopause. Learning about the causes of sleep disorders, both hormonal and psychological, will help a woman to better understand and cope with them. Keep reading to learn more about the hormonal and additional causes of sleep disorders. The primary reason why a woman may develop sleep disorders relates to the hormonal fluctuations that are taking place within her body. 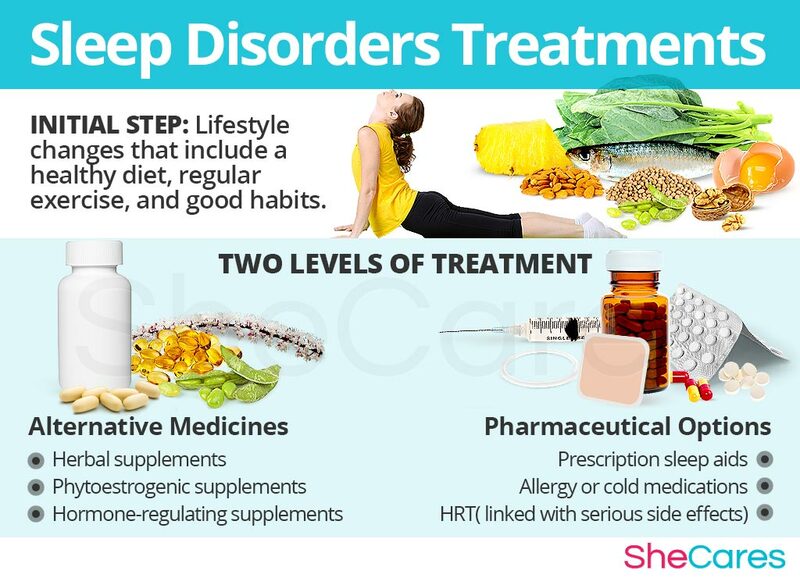 Thriving or declining levels of hormones, specifically estrogen and progesterone, affect a woman in a myriad of ways; one of the most devastating results of these hormonal changes are sleep disorders. Lower levels of estrogen are linked to an increased incidence of snoring or disturbances in breathing, and thus may cause sleep disorders. At the same time, progesterone works to induce sleep, so lowered levels of progesterone can make a woman more prone to insomnia. Puberty is the stage in which a girl's body begins to produce reproductive hormones; these and other factors, such as family and academic pressures, contribute to sleep disorders during puberty. Pregnancy leads to extreme changes in the production of reproductive hormones, which along with other factors, like discomfort or bodily changes, can lead to sleep disorders. Postpartum and breastfeeding is another stage where reproductive hormones are imbalanced, leading to symptoms like sleep disorders. Menopause is the natural decline of reproductive hormones that signals the end of a woman's fertility. As well as hormonal causes, other factors add to the reasons for sleep disorders during menopause, including the experience of other symptoms of menopause. In addition to the hormonal causes that lead to sleep disorders, there may also be psychological causes that can lead to these conditions. Throughout her reproductive life, a woman must undergo a great deal of physical changes which can lead to feelings of anxiety, depression, and stress. Anxiety is linked to an inability to fall asleep, while depression has been known to cause early morning awakening. Although the most likely cause of sleep disorders for women is hormonal imbalance, some women are simply more prone to sleep disorders than others. 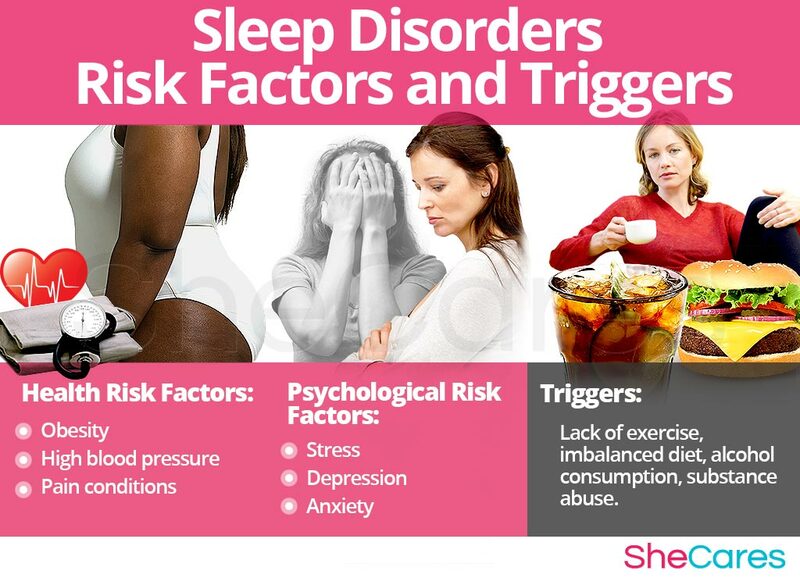 Keep reading to discover what the risk factors and triggers have an effect on a woman's experience of sleep disorders. Some women are more prone to sleep disorders than others for inherent behavioral and health reasons. Factors such as race, age, and lifestyle decisions all influence a woman's likelihood of developing sleep disorders. Studies have shown that Caucasian women are the most likely to have difficulty staying asleep throughout the night, while Hispanic women possess the least difficulty. The incidence of sleep disorders increases with age, with older women having a higher incidence. Other lifestyle choices such as caffeine and alcohol intake, or obesity, also have an impact on the likelihood that a woman will experience sleep disorders. Therefore, some women are more likely than others to suffer from sleep disorders for inherent psychological and health reasons, such as obesity, stress, or pain conditions. These predisposing factors can affect a woman's hormone levels and increase the chances that a woman will develop a sleep disorder during her reproductive life. In addition to long-term risk factors, sleep disorders can also be triggered by certain environmental phenomena and behavioral habits. 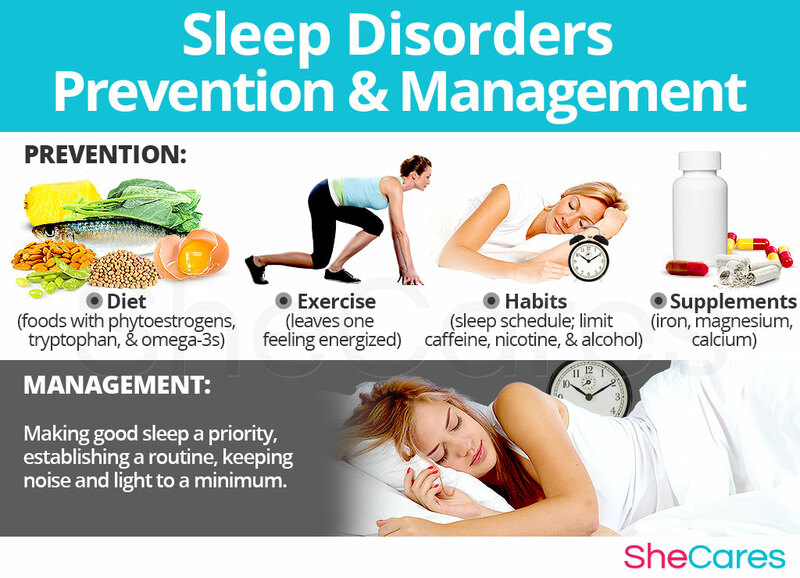 Avoiding these environments or habits as much as possible may help to avoid the onset of sleep disturbances. These include lack of exercise, poor diet, and substance abuse. Continue reading to discover the signs and symptoms of sleep disorders to be able to choose the proper treatment. Continue reading to learn more about these symptoms. Further details concerning the testing process and diagnosis of sleep disorders will also be outlined. Each woman has her own way of managing her emotions, stress, and her environment. 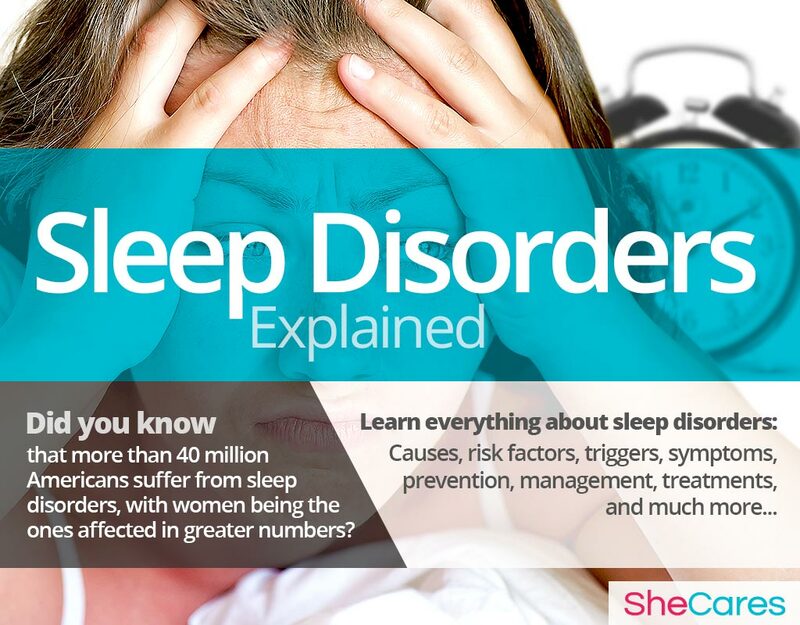 Consequently, all women experience the symptoms of sleep disorders differently. However, many of these symptoms are common among women going through a period of hormonal imbalance. Women may suffer from a number of these symptoms, while others may experience only one or two. The intensity and frequency of these symptoms can also vary. 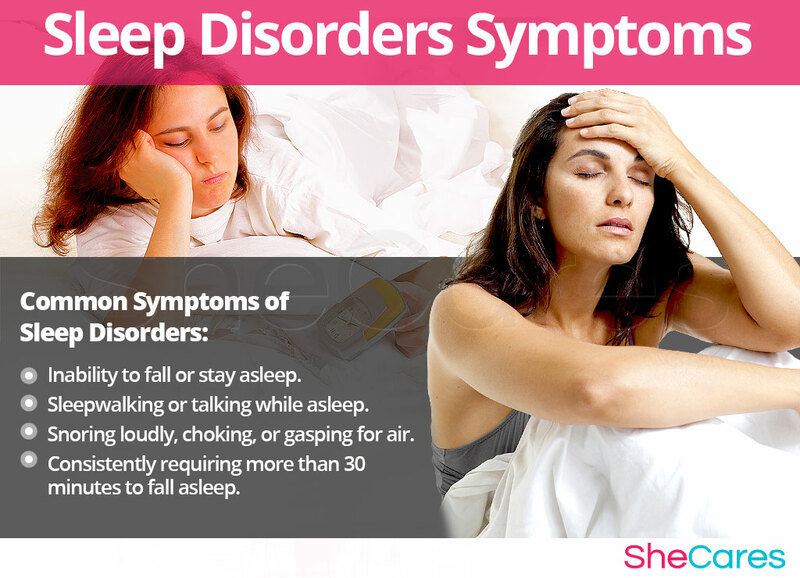 Typical symptoms of sleep disorders include an inability to fall sleep, sleepwalking, and snoring. To diagnose and identify the symptoms of sleep disorders, there are multiple methods one can pursue. A doctor should review the patient's medical history and conduct a physical exam, followed by a psychological evaluation. This may determine the source of a sleep disorder. Additional tests may then be completed at a sleep center that specializes in the diagnosis and treatment of sleeping problems. In rare cases, when sleep disorders are left untreated, they can lead to certain complications, which are more risky for a woman's emotional and mental health. However, it's important to remember that in the majority of cases, sleep disorders will not require any serious medical intervention. These possible, but uncommon, complications can include depression, weight gain, and other health problems, which have some specific warning signs. It is important to look out for these symptoms and monitor them in order to distinguish when they could be a sign of a more serious condition. Women who experience severe and frequent sleep disruptions may wish to treat or prevent them. Keep reading below to learn about how to prevent and manage sleep disorders. Although there is no way to completely prevent sleep disorders, there are a few steps that a woman can take to lessen her chances of developing them, or to minimize the impact of these symptoms. Lifestyle changes for prevention are extremely important, especially with regard to diet, exercise, and healthy habits. Moreover, a woman may seek additional ways to complement these lifestyle approaches with the use of supplements and, therefore, help to prevent or ease symptoms of hormonal imbalance such as sleep disorders. Continue reading to learn more about lifestyle changes for the prevention of sleep disorders. For women who are already experiencing sleep disorders, prevention may not be possible. Fortunately, there are many ways to manage them in order to prevent these disturbances or to lessen the intensity of symptoms. Keep reading to learn about the different ways to manage sleep disorders. When experiencing a sleepless night, there are ways to instantly manage the situation. Take note of the following advice to relax and get a better night's sleep. Tips and tricks are available that can help improve the experience of sleep disorders, giving women the tools they need to cope with these inconvenient episodes. There are general tips that women of all ages can use, such as establishing a routine or learning relaxation techniques. Moreover, there are other specific guidelines for managing sleep disorders according to the stage in which a woman experiences them. Although many herbal supplements come in professional-looking pill bottles, they are not regulated by the FDA, so they may not have the best concentration of the herbs you want. Always do plenty of research about the company before you buy any products to ensure you're getting the best herbal supplements available. There is no denying the importance of a good night's of sleep. Unfortunately, many women do not experience the quality of sleep that they require on a regular basis. Sleep disorders can be frustrating for any woman who experiences them; however, some disturbances are so severe that they begin to interfere with daily life. Fortunately, it's more than possible to find an effective treatment for sleep disorders. Three levels of approaches can be considered for treating sleep disorders. These are categorized as: (1) Lifestyle Changes, (2) Alternative Medicine, and (3) Drugs and Surgery. This primary level of treatment involves the least amount of risk, though conversely it requires the highest amount of self discipline. Many times some simple changes in lifestyle can reap huge benefits in fighting sleep disorders. Simple lifestyle alterations, such as exercising, practicing stress relief techniques, cutting out caffeine and alcohol, and using the bedroom only for sleep, can all be helpful. While these changes will help alleviate sleep disorders, they do not directly address hormonal imbalance, which is a common cause of sleep disorders, and so further treatment may be necessary. Alternative medicine has proven to be an excellent way of treating sleep disorders related to hormonal imbalance in a safe and natural way. Oftentimes, a combination of both levels is the most effective approach. Alternative approaches involve little to no risk and can be an extremely effective way to treat sleep disorders. This level of approach can involve several different therapies. Herbal supplements are the most prominent. In addition to herbs, women may try acupuncture, hypnosis, aromatherapy, or massage to improve their sleeping patterns. However, most women find that herbal supplements are the easiest alternative treatment to follow and the others require a greater time and financial commitment. In addition, herbal supplements are the only viable option to treat the hormonal imbalance directly at its source. Alternative medicines and supplements involve little to no risk and can be an extremely effective way to treat sleep disorders. In the case of herbal supplements, there are two main types that can be used: phytoestrogenic and hormone-regulating herbal supplements. These supplements, such as black cohosh, contain estrogenic components produced by plants that complement the low estrogen hormone levels in a woman's body. By introducing plant-based estrogens into the body, these herbs treat the underlying hormonal imbalance responsible for some sleep disorders. However, as a result of adding outside hormones, a woman's body may become less capable of producing estrogen on its own. This causes a further decrease of the body's own hormone levels. They are mainly effective for menopausal women, but are not necessarily effective for women in other stages of life. Natural treatments that do not contain estrogen, like Macafem, can alleviate the hormonal imbalance that can cause some sleep disorders, while improving the overall functioning of the hormonal system. These herbs stimulate a woman's hormone production by nourishing the pituitary and endocrine glands, causing them to more efficiently produce natural hormones. Hormone-regulating herbal supplements are the safest and most natural way to treat the underlying hormonal imbalance behind sleep disorders, and can be taken throughout a woman's life, as they support the body's natural hormone production. Additionally, there are some other types of supplements that can also alleviate sleep disorders, or at least make them more manageable, including massage, acupuncture, aromatherapy, and hypnosis. A combination of approaches is usually the most effective route to take. Lifestyle changes combined with alternative medicine will most likely be the best way to alleviate the symptoms of sleep disorders. However, for some women the symptoms will require more drastic treatment is necessary. Various prescription sleep aids are available including zolpidem (Ambien), diphenhydramine (Sominex), and doxylamine (Unisom), amongst others. While these may be effective in the short term to fall asleep and stay asleep, they may cause dependence over time and don't promote the healthy REM sleep that is necessary for healthy mind and body functioning. Side effects may occur as the result of taking any drugs; it is recommended that such medications are taken such only when necessary and under the advice and monitoring of a healthcare professional. These three approaches are not mutually exclusive. A woman may use different approaches at different times or any combination of them, depending on the duration and severity of symptoms. Today more and more women find that dealing with menopause symptoms is best accomplished through a combination of healthy lifestyle and alternative treatments.